You have released a marvellous CD Album with the Complete Works for Solo Double Bass by Dittersdorf, teacher of Vanhal and among the friends of Haydn and Mozart. Can you tell us about these special rather demanding and magnificent works left by Dittersdorf, the story behind them and their fortune among the contrabassists, also today? What led you to produce this special CD Album with the music by Dittersdorf for the Solo Double Bass? What attracts you most about Dittersdorf's music, with that for double bass especially written between 1766 and 1767? Without Johannes Matthias Sperger (1750 – 1812) however, Dittersdorf's concertos for double bass, the concerto by Vanhal, and many other solo works for the instrument would now be lost forever. Sperger was not only double bassist in Haydn's orchestra at Esterházy, but a virtuoso solo performer in his own right, and a prolific composer too; he is credited with at least eighteen solo concertos, a handful of sonatas, many beautiful pieces of chamber music with double bass, as well as orchestral music, much of which is only just coming to public attention. Dittersdorf's autographs of his works for double bass have not survived, but it was Sperger's set of parts, in the hand of a careless Viennese copyist, that provided the sole basis for the survival of both concertos, the sinfonia concertante for viola, double bass and orchestra, as well as the duetto for viola and double bass. They were composed for the brave Pischelberger whom Dittersdorf himself met in Vienna in 1760s and then employed as one of the soloists in his orchestra at Court in Grosswardein (now Oradea, Romania), and Rodney Slatford's Yorke Edition first published these in 1978, decades in advance of the Urtext movement. Georg Hörtnagel's LP recording of Dittersdorf's second concerto, on the Turnabout label (along with the Sinfonia Concertante) ensured its popularity with bassists, and it retains its utility as an audition piece for many orchestras around the world. My own relationship with Dittersdorf's second concerto began in 1980, when I performed the Schott/Tischer-Zeit version with University of Cape Town's Symphony Orchestra conducted by Allan Stephenson; I still possess a cassette tape of the recording we made a few days after that performance, and it reminds me of the ground I have covered since then. It was my own curiosity that initially drove me to learn all of Dittersdorf's music for double bass, before I moved on to the concertos by Vanhal, Zimmerman and Hoffmeister, whom I subsequently discovered to have composed three concertos and four solo quartets for the instrument. I also began to explore the slightly earlier concertos by Capuzzi, Pichl, Cimador and Kohaut, and although I already have two of his sonatas in my repertoire, my exploration of Sperger's concertos has only just begun. Participating in the London Mozart Players' Contemporaries of Mozart recording project as principal double bass under the baton of Matthias Bamert, introduced me to unfamiliar composers and many new works, whilst the Academy of St Martin in the Fields' unique manner of working allowed me the opportunity to explore the iconic standard classical repertoire much more deeply. The Academy of St Martin in the Fields has enjoyed a special affinity and acclaimed relationship with the music of the classical period (see the extensive recordings of the symphonies, concertos amongst others, by Mozart, on the Philips label) and proved to be the perfect partner for my project to record this CD of all Dittersdorf's solo works for double bass; it will remain a durable testament to a supremely rewarding chapter in my musical life. For this recording I decided to perform the Yorke Edition version, along with Sperger's own cadenzas, and my friend the conductor and musicologist David Murphy prepared the orchestral material from Sperger's set of parts. The more keenly attuned listeners will know that I perform both of Dittersdorf's Concertos in E-major, and I justify this on the grounds of the semitone scordatura employed in the second concerto; Sperger's orchestral parts are in the key of E-flat major. The use of a whole tone scordatura in solo repertoire is still employed today, since it enables more effective projection, something that can be a challenge for this unwieldy instrument. My enduring but as yet unfulfilled dream, is for the discovery of Haydn's Concerto for double bass (ca. 1763), which is presumed to have been lost in the fire at the Esterházy Court and given the quality of the double bass solos in his symphonies No. 6, 7, 8, 31, 45 and 72, it will be a magnificent composition. During his second London Tour, Haydn met the great double bass virtuoso Dragonetti and the two became friends, then Dragonetti reached Vienna in 1799 and 1813 and befriended also Beethoven and in 1813 Dragonetti was leading the double basses, during the premiere of Beethoven's 7th Symphony. You yourself have also prepared a The Strad Masterclass on Dragonetti's Famous Solo for double bass. 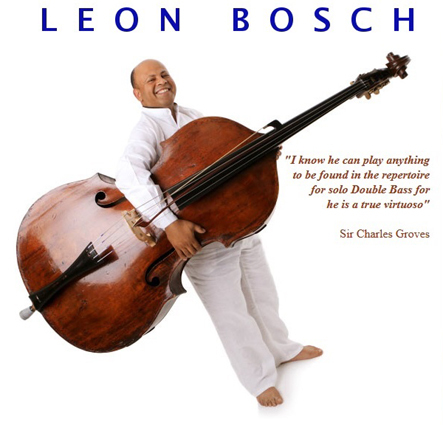 Can you tell us about this incredible artist, his life, his works and his technical work on the double bass, a man, whose legendary big hands were the origin of that special term man mostro (i.e. monster hand). Domenico Dragonetti's Andante and Rondo was the first solo piece that I performed in public and preparing for that performance transformed my relationship with Dragonetti into a life-long passion. 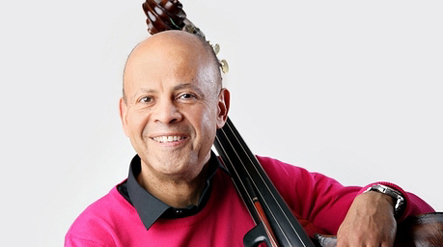 As a young student at the University of Cape Town I enjoyed the luxury of time to examine Dragonetti's music in microscopic detail, and by the end of a six-month period preparing for my first appearance as double bass soloist, I was confident that I had developed an informed understanding of the unique demands and indeed essence of Dragonetti's music. I was utterly convinced that I had worked out exactly how Dragonetti would have played his own compositions; the tempi, the fingerings, the bow distribution, the sound, nuances specific to his intellectual and psychological make-up, and so forth, but it wasn't until many years later, when I first used an authentic Dragonetti Bow (identical to the one that occupies pride of place alongside his Gaspar da Salò double bass at St. Mark's in Venice)... that my suspicions were finally confirmed! 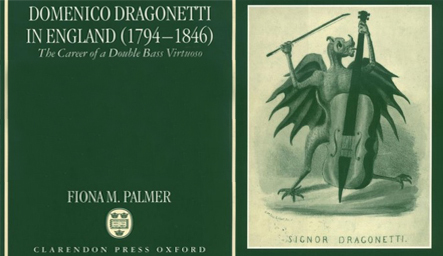 Dragonetti's output for the double bass is vast and varied, and although much of it remains unpublished, in collections at the British Museum in London, and the Boston Public Library, selected highlights are beginning to appear online, and hopefully this heralds a long overdue rehabilitation. His twelve waltzes for unaccompanied double bass represent an iconic contribution to the repertoire and should form the basis of every aspiring double bassist's education. It is my contention that anyone who can play these more than just perfunctorily well, will be well on their way to earning a living as an instrumentalist. 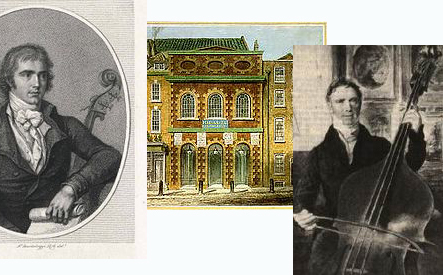 Rossini was commissioned to compose his vivacious Duetto for cello and double bass for Sir David Salomons (1797-1873) one of the founders of London and Westminster Bank who was also a keen amateur cellist, to perform with Dragonetti. 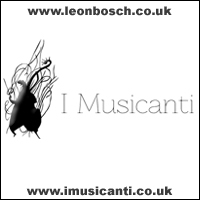 I am in the habit of performing this along with Dragonetti's own Duo for cello and double bass, an equally charming and challenging composition. Fiona Palmer's book about Dragonetti is not only an interesting read, it provides some useful insights into Dragonetti's many strengths and idiosyncrasies. After forty years studying, performing and teaching Dragonetti's music I have yet to record any of it, but hopefully my CD The Dragonetti Phenomenon, should materialise before too long. 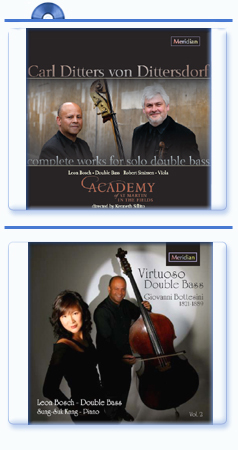 The works for Solo Double Bass represent such a peculiar and charming repertoire, since the double bass is not generally associated with beautiful and magnificent cantabile, while it, in reality, has wonderful possibilities. How do you see this special repertoire for Solo Double Bass from Dittersdorf and Dragonetti to the 21st century contemporary music and what are the perspectives for the future, in your opinion? 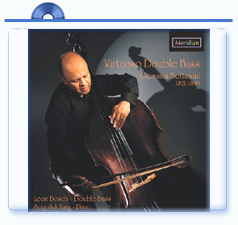 The repertoire for solo double bass is more extensive and diverse than even double bassists realise, and the instrument's expressive capabilities are often also grossly underestimated. I am not opposed to transcriptions in principle but following the exploits of the Soviet bassist Rodion Azarkhin who in his eponymous manner recorded his own transcriptions of works like Bach's Chaconne and Sarasate's Zigeunerweisen on the double bass, there appears to be an unhealthy obsession with performing transcriptions of anything from Bach's suites for solo cello, to Mozart's violin concertos and Elgar and Dvorak's cello concertos. Whether this represents a worthwhile musical endeavour, or the equivalent of Dr. Johnson's dog walking on its hind legs, merits some discussion, at the very least. Then in 1986, part of the prize I'd won in a competition enabled me to commission Pueblo for solo double bass from John McCabe. This year you are among the judges of BBC Music Young Musician 2018 with Jennifer Pike, you yourself are a teacher and you regularly give masterclasses. What was your experience like, in your role as a judge and as an educator? What leads you towards teaching? What are your pieces of advice and tips to the young performers who are approaching the works for Double Bass soloist for the first time? What are your projects for the future? Imparting the knowledge I have been fortunate enough to acquire over the course of a lifetime is not only a privilege, but my responsibility. My advice to aspirant young virtuosi? Respect yourself, respect the music you're entrusted with, respect the instrument you play, and resist the temptation to see life as a zero-sum game. Culture, creativity and artistic fulfilment ought never to be degraded into a competitive sport, but if there exists an element of competition in music, that competition has to be a personal one; how to become the best human being and artist one can possibly be? The double bass and I continue to pursue a passionate relationship, but thanks to Sir Neville Marriner's encouragement, I am now forging a career as a conductor, and also directing my own concerto performances from the double bass; a rewarding and inspiring challenge. (f) Franz Josef Keyper - The complete concertos for double bass and orchestra. 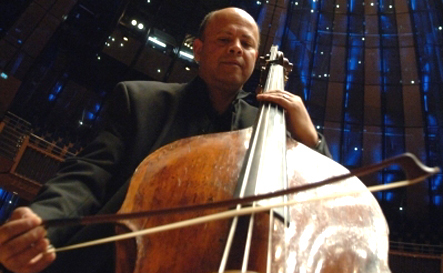 It is an honour to be the recipient of so much wonderful new music, and I will over the next three months be performing the world premiere performances of the Concerto for Double Bass by Paul Patterson, The Song of Bone on Stone for solo double bass by Robin Walker, and Isipho for double bass and piano by the South African composer Peter Klatzow. I will also visit India for the first time and direct a performance of Franz Keyper's Concerto No.2 in G Major with the Bombay Chamber Orchestra. This year has been particularly busy one for Schubert's Trout Quintet, and a performance that I am particularly looking forward to is with Benjamin Grosvenor at the SouthBank Centre on 29th May 2018. 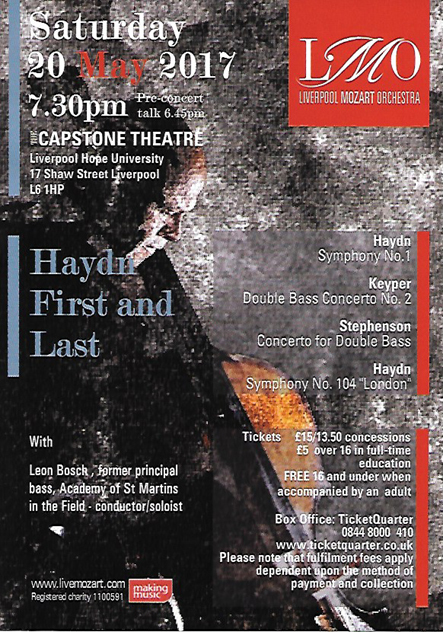 Haydn's London Symphony was the very first symphony I ever played, at the age of 16, with the University of Cape Town's Symphony Orchestra conducted by the British cellist, composer and conductor Allan Stephenson. The rather regal first movement opening Adagio made as profound impression on me as did the jaunty Finale, but it was the musicologist Professor Günther Pulvermacher who made me aware of Haydn's unique contribution to the development of the symphony, and his particular talent for turning mere fragments into a coherent whole. 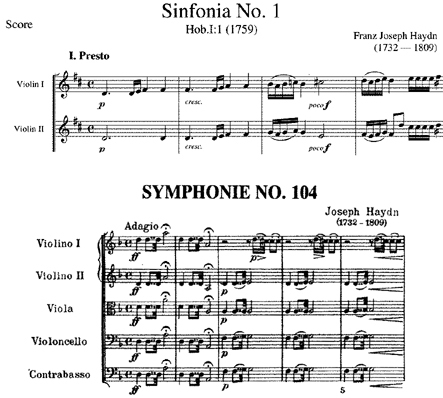 From that auspicious beginning in 1978, Haydn's 104th symphony would feature more regularly in my professional career than any other symphony, but I had to wait until the end of my orchestral career and the start of my journey as a conductor, to encounter Haydn's Symphony No.1 for the first time. In May 2017 I performed a concert with The Liverpool Mozart Orchestra in which I conducted Haydn's Symphonies No.1 and No. 104, and also directed two concertos from the double bass: Franz Keyper's Concerto No.2 in G major and Allan Stephenson's Concerto for double bass (2005). The quality and maturity of Haydn's first symphony belies the youth of its composer, and it has become a firm favourite of mine. 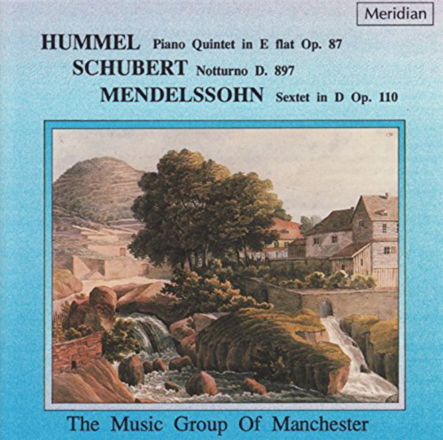 Hummel first came to my attention when I performed this very Quintet for piano, violin, viola, cello and double bass, that proved to be the inspiration for Schubert's Trout Quintet. A composer who employed the double bass in his chamber music was naturally going to find favour with me, and I have over the years performed this Quintet and his Septets with piano and double bass on a fairly regularly basis. Hummel's output as a composer is vast, including 8 piano concertos, 10 piano sonatas, a piano quartet, 8 piano trios, concertos for mandolin, bassoon and trumpet, sacred music, ballet music, sets of variations and potpourris for various solo instruments, as well as compositions for guitar, an instrument for which he enjoyed a special passion, also thanks to his friendship with M. Giuliani. He curiously never composed a symphony however, but did make particularly elegant arrangements of Beethoven's symphonies, for piano, flute violin and cello, and these are on the agenda for performance and recording with my ensemble, I Musicanti. Leopold Anton Koželuh (1747 - 1818) - Sinfonia Concertante for trumpet, piano, mandolin and double bass. 2. 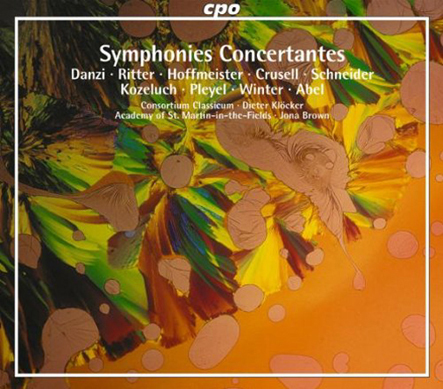 Koželuh's challenging, idiomatic and sensitive writing for each of the soloists, as well as his skilful orchestral accompaniment, demonstrates a highly informed understanding of the capabilities and potential of each of the solo instruments. Karl Ditters von Dittersdorf's autobiography ought in my view to be compulsory reading. 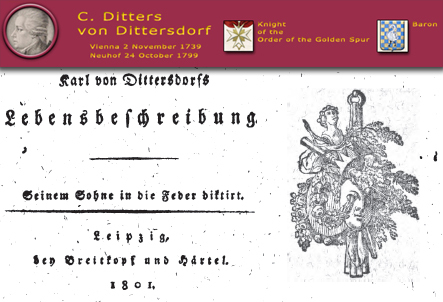 at von Dittersdorf WebPage, where you can find also a complete edition of the Dittersdorfiana. It was whilst I was preparing for my recording of Dittersdorf's compositions with The Academy of St Martin in the Fields that an ex-student of mine, Carl Hinde, alerted me to the existence of Dittersdorf's autobiography. In it he provides us with an unparalleled insight into the artist's relationship to the aristocratic society at that time. It also describes in some detail his own education and development as an artist and illuminates his personal journey as the servant to the Archbishop of Grosswardein and then in Johannesberg with the Prince-Bishop of Breslau, Philipp Gotthard von Schaffgotsch, both as Hofkomponist and then also as Amtshauptmann (Governor) of Freiwaldau (1773), officialy becoming also a Baron in that period, offices that let him, from time to time, reach Vienna and attend its soirées, salons, concerts and theatres and meet there with Mozart, Haydn, Paisiello and the others. Dittersdorf was of course a virtuoso violinist (and violist) first and foremost, and in addition to 18 concertos for the violin, 5 for the viola and 3 concertos for two violins, his vast output includes the first mature cello concerto of the classical era, the only concerto for oboe d'Amore that I know of in the classical period, over a hundred symphonies, concertos for string quartet, piano, harpsichord, oboe and flute, sacred music, opera, oratorios and cantatas. During the late 1970's and early 1980's whilst I was a still a student in South Africa, I established contact with Doblinger music shop (established in 1817) in Vienna, on account of their healthy catalogue of sheet music for the double bass, and spent all the money I earned from my party-time job selling refreshments in a cinema kiosk, buying as much music for double bass from them as possible.